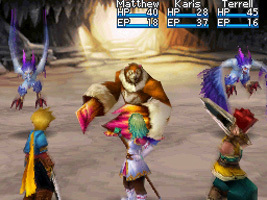 At the end of Golden Sun: The Lost Age, the heroes succeeded in bringing back the Golden Sun to heal the world of Weyard, creating all new continents and new species. 30 years later, a new threat emerges in the form of Psynergy Vortexes, sucking the elemental psynergy from the world and from the adepts that wield its power. It is up to the children of the former heroes to confront this new evil that threatens Weyard and all who live there. The Crystal Dragon summon is based on the North American TV advertisement for the original Golden Sun. In the ad, a chandelier transforms into a crystal dragon in a theater. In the summon, the Crystal Dragon appears exactly the same as in the ad, and the background changes to a theater setting.